Great to Be Here for the New Year! I’ve been on a bit of a hiatus because we were traveling for the holidays, visiting Cute W’s family in Kansas City. We were supposed to leave on December 22nd and return on the 28th, but travel was a challenge. On our trip out, we barely made our connecting flight. As in, the airline told us that we would not make the connecting flight, and then we lucked out when the connecting flight was late, so then we were sprinting out of the first airplane as they were calling our family’s name on the loudspeaker for a last call. We had to run to a gate that was only about 40 feet away, but there was one of those long moving sidewalk contraptions blocking our path, so we were all yelling, “That’s US! We’re HERE!” as we tried not to run into people. And then on Monday the 28th, there was just enough snow and ice in Kansas City, Chicago, and Albany to screw things up crazily. Our flight was cancelled according to the airline and still running according to the airport and we were on hold with customer service for almost an hour and next thing you know, instead of leaving together late Monday morning we were leaving on two separate flight schedules, both late on Wednesday. Of course, we did our best to make the most of the extended visit, but meanwhile all of the grown-ups had obligations to work around and meanwhile our cat sitter was running out of cat food and everyone was just ready to be home. Originally, Cute W and J were going to leave before M and me and fly through Baltimore, then we’d leave an hour later and go through Chicago. Then there was another flight delay for Cute W and J, and their connecting flight was looking iffy. So then, we get to airport on Wednesday and we’re checking in. And I realize that I don’t have my driver’s license. We searched frantically, I prayed to St. Anthony and tried not to cry, and Cute W was fighting off the urge to throw up. No luck. Typically, when I fly and need to keep pulling it out, I’ll leave my ID in the back pocket of my jeans. But on the day we’d arrived at Grandma and Grandpa’s, my jeans had ripped and I’d thrown them away. Interesting fact: you don’t actually need a picture ID to fly. Instead, you get the extra-supreme-o, possible-terrorist treatment in security. They combed over all of my belongings (which was funny, because they skipped M’s, even though we were clearly together), and then they gave me the full-on body massage pat-down. Which was funny because they spend about 50% of the pat-down time emotionally preparing you for the fact that the back of a woman’s hand would be brushing against my “sensitive areas.” M was getting all irritated, and I’m sure it would have been annoying if I’d been picked based on my name or ethnicity, but, as I pointed out to M, this was completely my fault. I was just so grateful that they were letting me fly! Anyway, our flights were relatively uneventful. Meanwhile, Cute W and J were dealing with an emotional roller coaster as the airline told them that they wouldn’t make their connecting flight, then re-booked them somewhere else, then got them on the original flight, after all. At one point they came up to their gates and the door was already closed and J was sobbing. Poor thing. But we finally all made it to the Albany airport a bit after 1 am on Thursday. Which meant that we managed to celebrate New Year’s Eve, but both Cute W and I were fast asleep before midnight. Locks, so that I can lock up my scissors. I’m always complaining that my scissors disappear because the girls steal them. What a thoughtful idea! 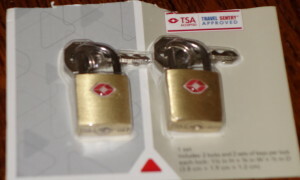 And, look, perfect for this post: they’re TSA-Approved! J got Cute W some Star Wars figures and, for M, another clever and thoughtful gift: earplugs, because M always complains that J’s trumpet practice is too loud. What a cutey-patootie! I’m going to be on WNYT’s Weekend Today tomorrow morning, Saturday at about 8:15 am, talking about making January fly by for KidsOutAndAbout.com. If I’m not looking my best, it’s because I’m still sleep deprived. Hope you all had wonderful holidays!